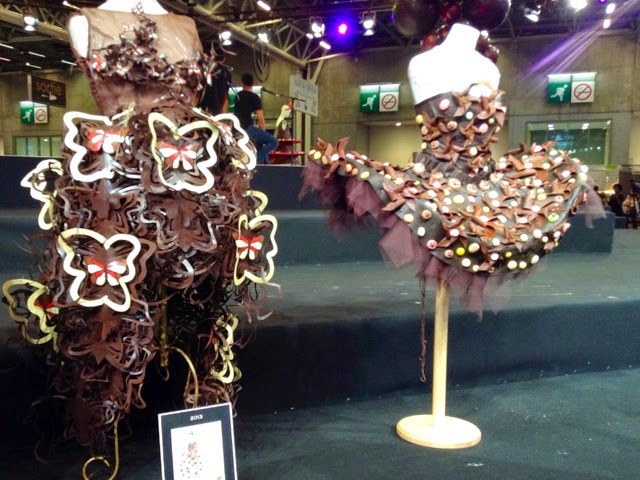 After reading all your oohing and ahhings to my previous post I made a dash out to Porte de Versailles the last day of the Salon du Chocolat 2014. 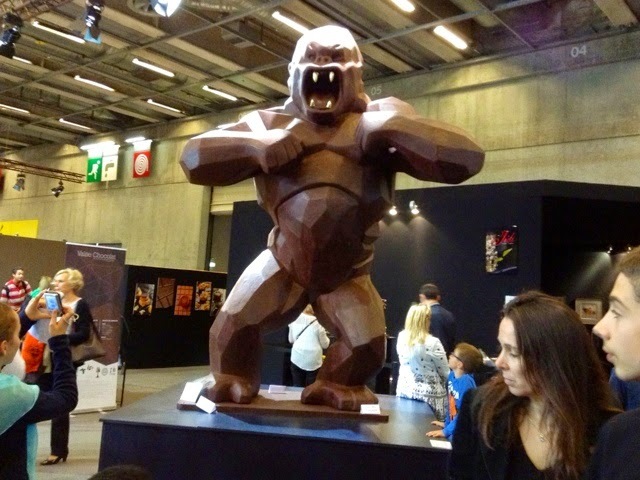 Naturally I was feeling completely in control of my cravings like the 'Le Kong' chocolate sculpture from Jean-Paul Hévin. NOT. The Baba Tropical at Laurent Duchene beckoned. Why not? Research no? Yes, it tasted every bit as good as it looked I'm happy to report. Light, delicate, and passion fruity with not too much rum. The closing day of the salon is always a mad house. Many tempting items were gone (fortunately for me). The French are famous for celebrating anything at all at the drop of a hat. 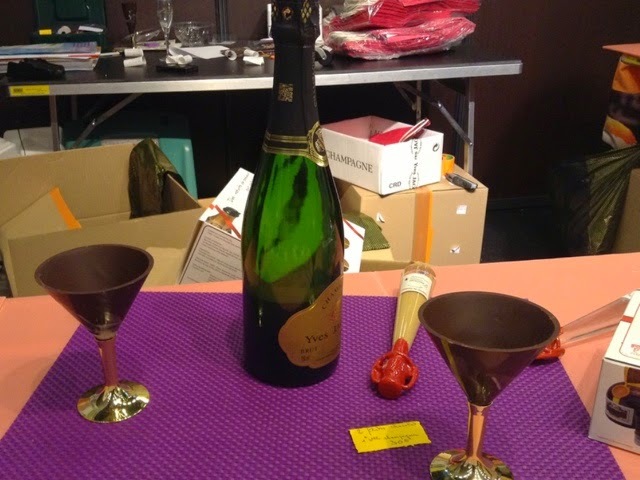 No anniversary or birthday required to pop open their champagne. Why not drink from a chocolate flute and then eat it? 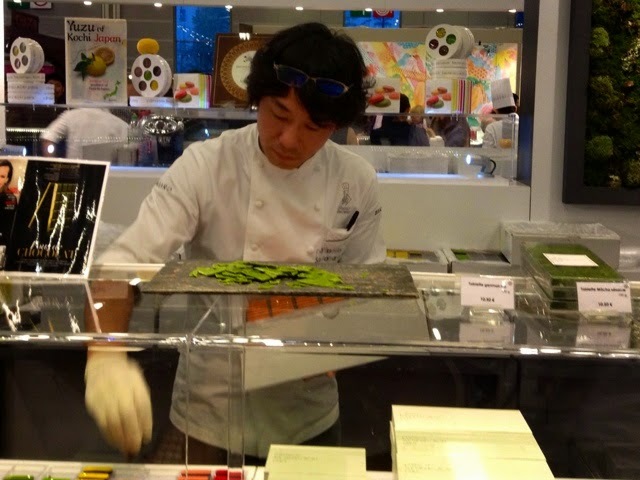 Top patissiere, chocolatier Sadaharu Aoki was there everyday at his stand. I decided to not resist his big chocolate macaron enrobed in green tea batter hot off the griddle or whatever this thing is. I'm glad I caved. 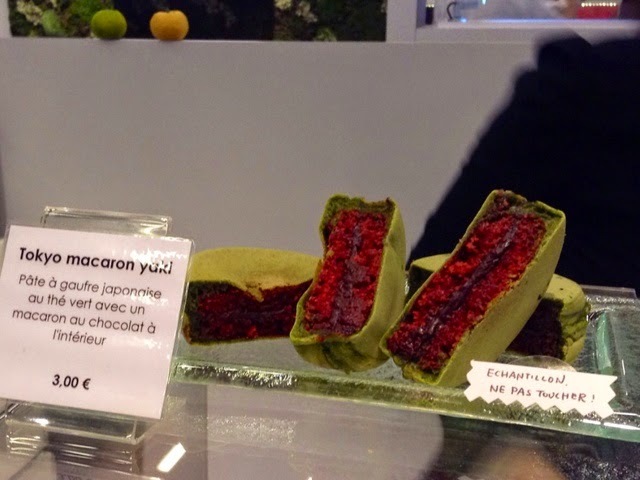 The chocolate macaron melts inside the non-sweet green tea batter making a perfect contrast of flavors and textures and a steal at 3€. Plus you won't see this again till next year so it's a 'Le Must'. 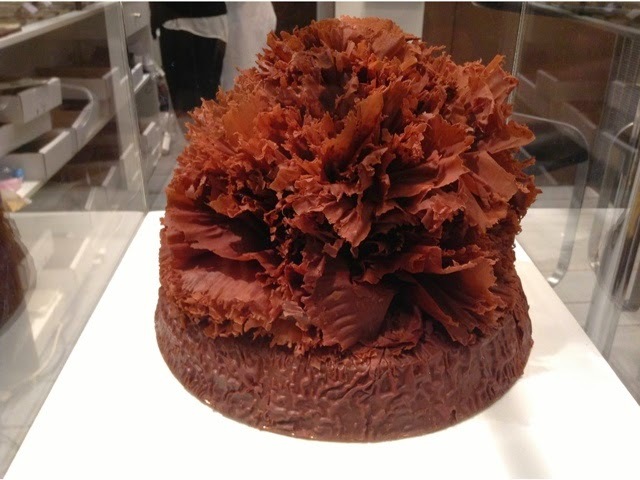 An exquisite autumnal leaf creation from grand French mark of Lyonaise chocolatier, Bernachon. 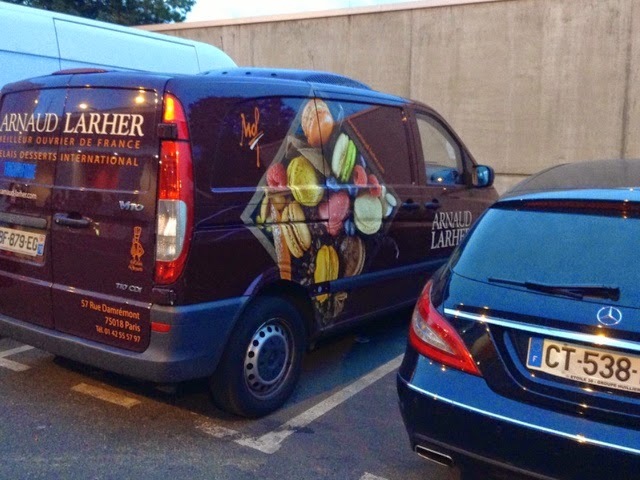 They have been making fine French chocolates since 1953 and their quality has never wavered. Another Le Must if you're visiting Lyon. 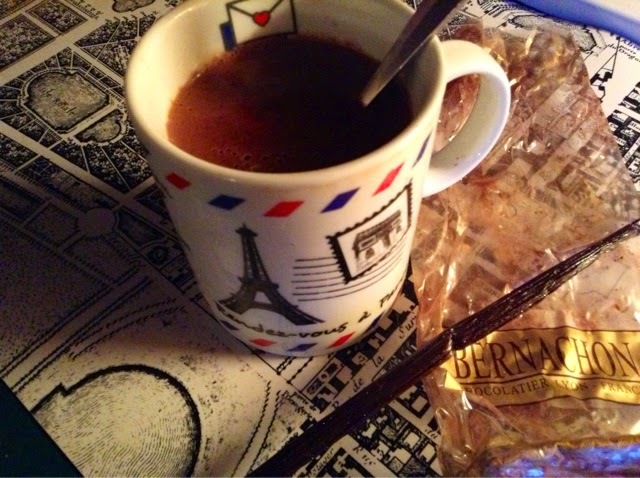 I got a bag of Bernachon unsweetened cacao and my morning cup of hot chocolate has a superior taste these days. I may have to visit Lyon to replenish. 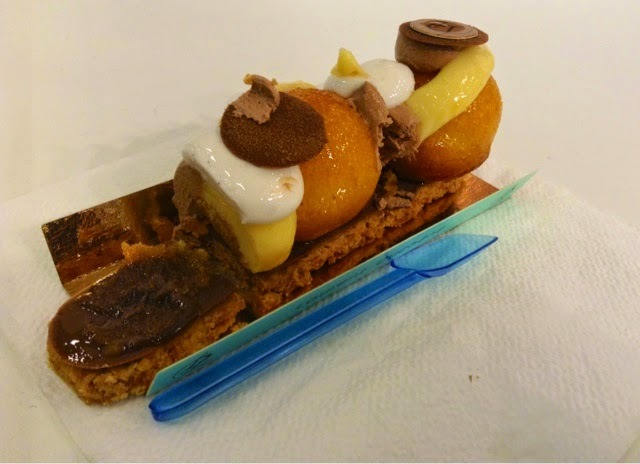 After 3 visits to the Salon I finally got a glance at some of the chocolate creations by patissiers and designers. Plus the finale fashion walk. A little bit of video on Flickr HERE. Pralus was busy cleaning up early at 5pm. Have they read The Life-Changing Magic of Tidying Up too? Not a single crumb of praline to be seen. Time to go home. Everyone is sated and full of chocolate. Me too. 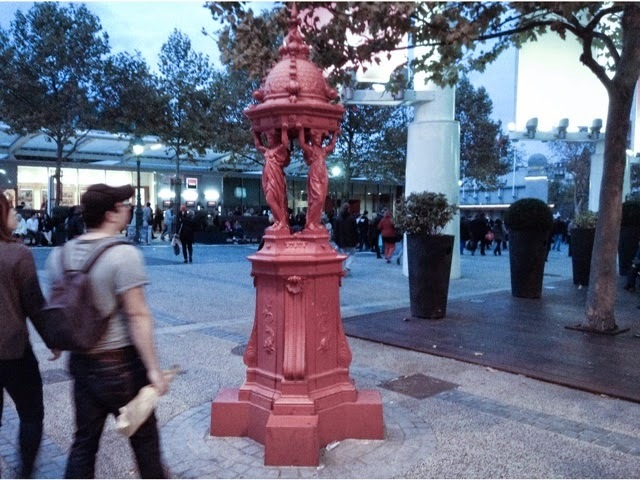 I hadn't noticed this chocolate-brown painted Wallace fountain before. The gent passed his hand under it but no hot chocolate flowed. Dommage. 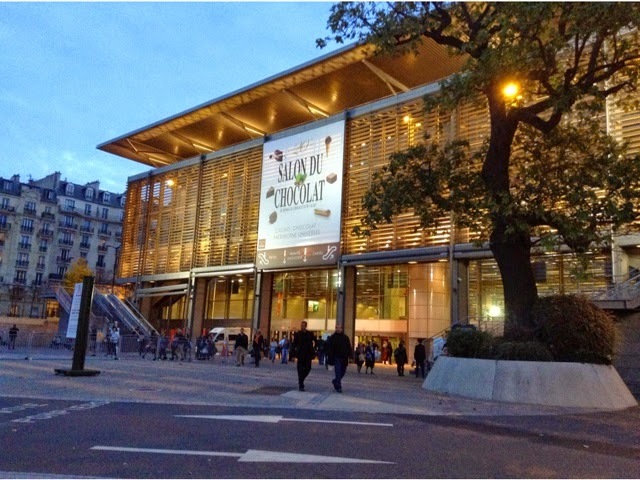 Bye Bye till next year Salon du Chocolat et merci! I think I like your mug the most! Adorable! All good things do come to an end don't they? That's a very nice mug. Is it for sale? :)) même chose ! is such a nice mug for sale ? I ordered the Tidying up book on Amazon one click. I am desperate to get my house in order. I feel as though I clean and organize and clean and organize and it still looks as though a very ADD mind resides in the midst of stuff creeping into every nook and cranny. My son says -the stuff is pretty Mom but there's waaaaaaaaay too much of it! The story of my life except the cleaning up sessions are few and far between..
Oh, where did your adorable mug come from?? I look forward to every single paris Sketch Letter. Oh, my -- you went THREE times?? "The closing day of the salon is always a madhouse." Seriously, when is it ever NOT a madhouse? 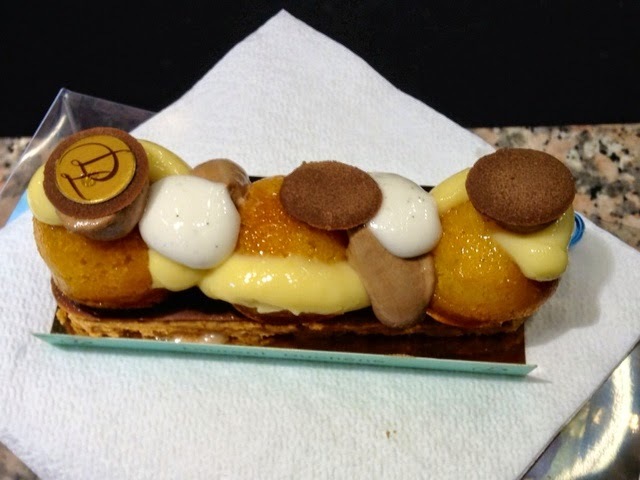 Must plot a trip to Lyon to revisit Bernachon. Any word on Denise Acabo, BTW? 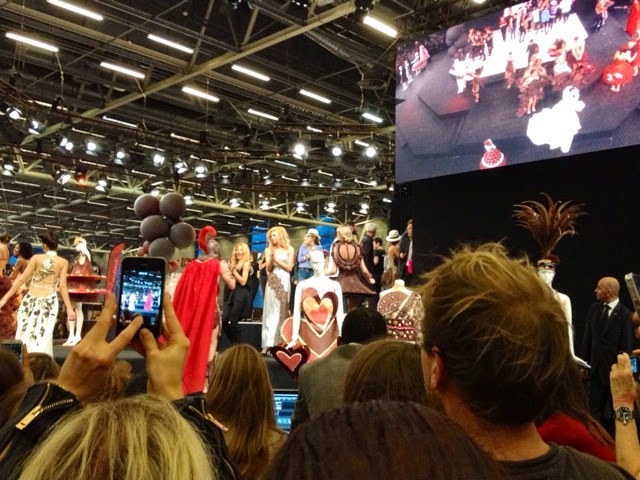 If you go the 1st day of the chocolate show on Wednesdays it is not so crazy and really something is missing. you need the craziness to have the most fun in my opinion. 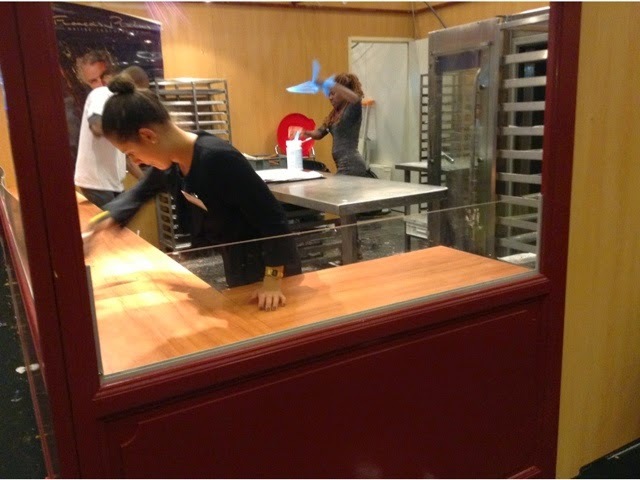 Sadaharu Aoki is tied with Carl Marletti for my favorite Paris pastry chef. 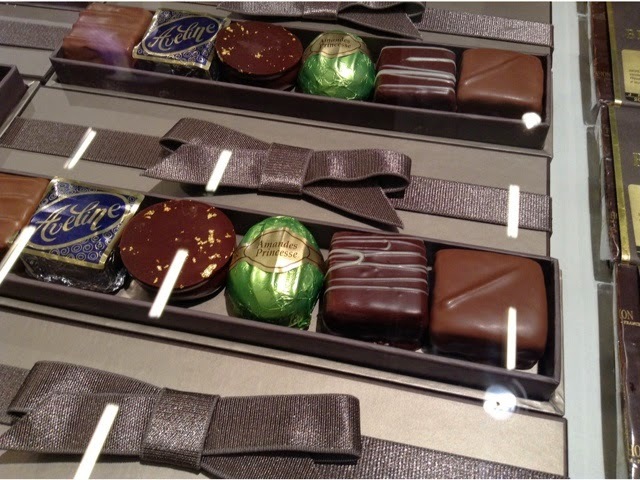 I've never tasted his chocolates though - am addicted to his millefeuilles with matcha! Have you tried his black sesame éclair Karen? to dye for or Tombe here. Also those green tea globes he does are out of this world. I love the look of CM but the taste is not as adventurous imho. Ah! Europe where they take the pleasures of the flesh very seriously. Hope all is well and you continue to delight in your new home! cheered me up big time. I went out and ordered the book on tidying. Keep up the good work. I doubt if I've ever tasted anything as good as at the Salon, though. I love "Kong" ;) And, the chocolate glasses, and your opening watercolor! 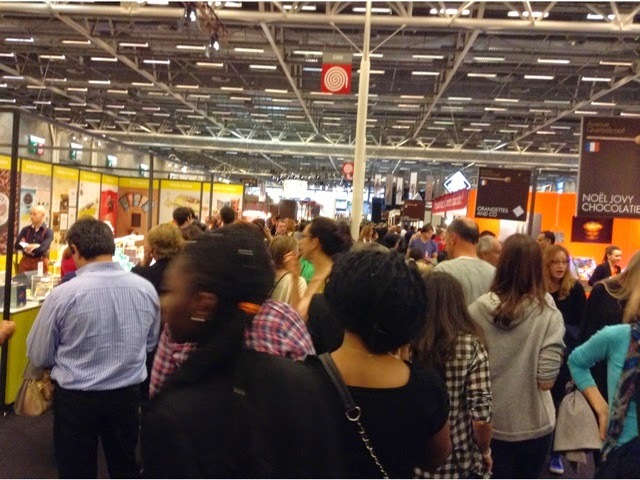 Course on the other hand Maison et Objet is a complete mystery for me to navigate and there are 8 buildings plus I dont know that market or how to read the trends. Different ballgame altogether. 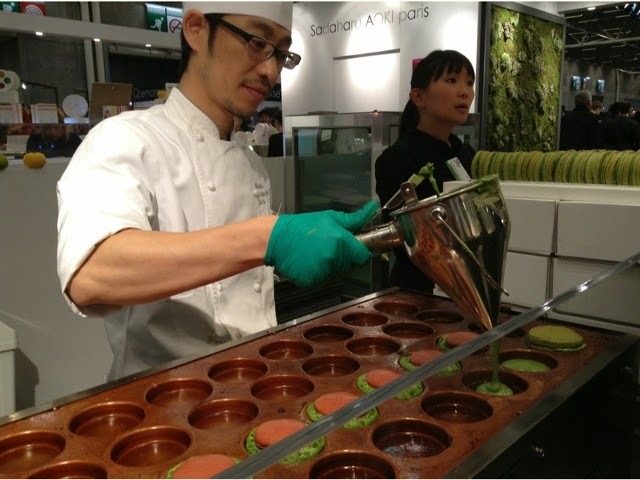 I was so close to Sadaharu Aoki's shop the last time I was there. Had heard about him through your blog. I will not make the same mistake twice. I have miniature WAllace Fountains. I know one of my grandchildren and I would love to have the chocolate one to nibble on. Great post. Gives you something to dream about. Your collage at the top should be the official poster for next year's show! That cup is so awesome, too! There is so much crazy creativity it goes beyond just controling your cravings. 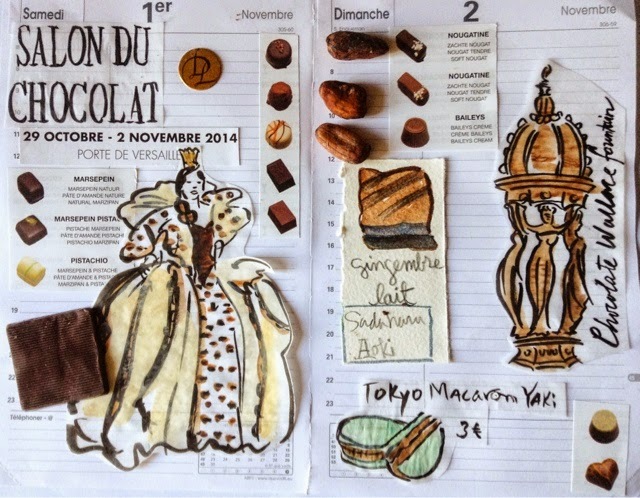 Pastry/chocolatiers are artists and this their big show so it's sad to miss out. Bring a limited amount of cash. That's what I do. Like a kid's allowence. The one in London is really fun and lots of free tastes of new things. uplifting...I know I can count on getting a little jolt of happiness when I click on your site. Thank you ! 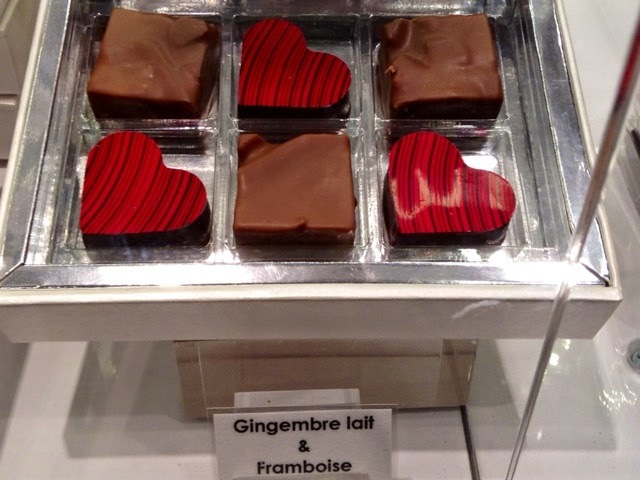 I swear I only f=left town for a week and you just went to the Chocolate show without me! Zounds. they deleted my comment. I nearly had heart failure when I tried to find your blog spot and had a notice on my screen that this blog cannot be found. Yikes. But my computer has been a bit wonky lately and when we tried again, here you are. Such a relief. You are an addiction. What would I do without Paris Breakfast. Many thanks. Oh lalaTokyo macaron Yaki...magnifique! Avez-vous touché l'échantillon, huhu?I hope so! Beautiful painting and the baba looks to die for! YUM! And I do love your opening "page" of art!